To say that I hoarded is an understatement. 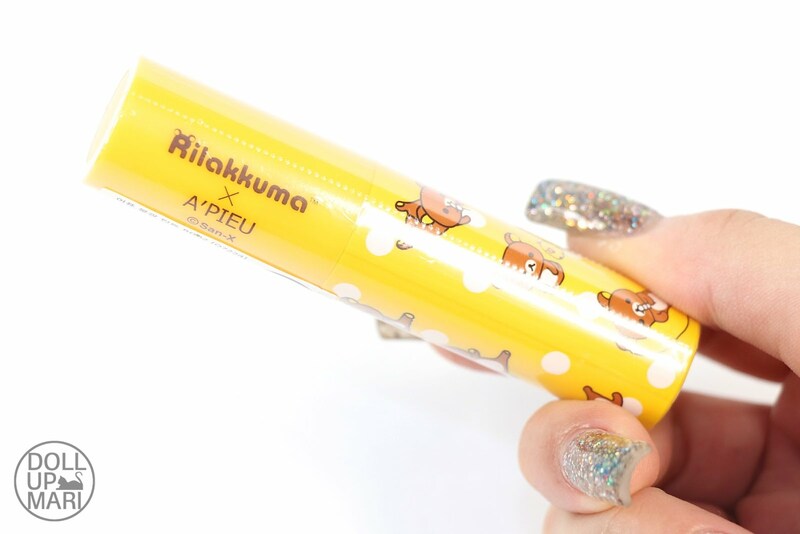 I went crazy when Althea launched A'Pieu's Rilakkuma collection and sold everything at reasonabele prices!!! I was so thankful I did all my hoarding in Althea because when I was in Korea, despite the collection still in sync, the A'Pieu in Myeongdong is not on the main road so it's very easy to forget it. Like by the time you get to the A'Pieu store it's already closing or near closing coz you got distracted shopping at all the other stores on the main street. These items are also delicate in nature with the eyeshadows and the facial wash tubes, so I am glad I was not tasked with having to wrap them and pack them into a suitcase. Sooo this is how it looks like. 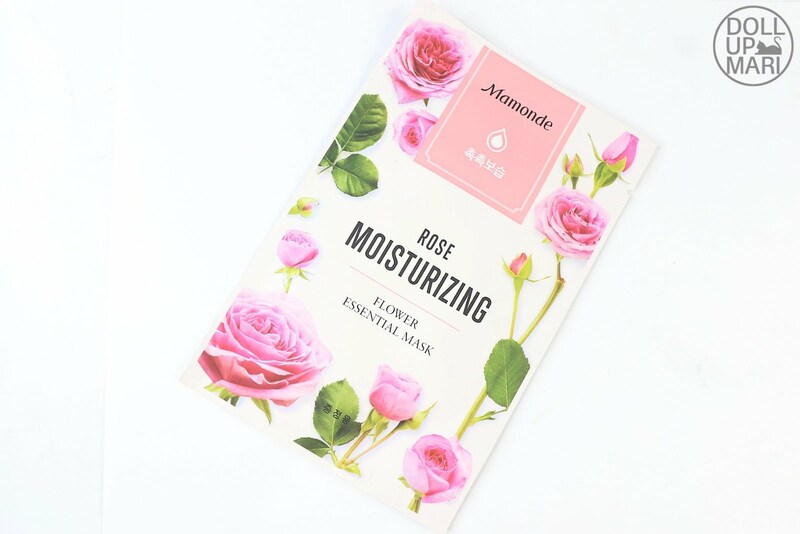 I found it funny to be receiving a Mamonde mask for a box wherein all my purchases were A'Pieu items hahaha. Buutt I am so happy it's rose! I have no idea what purchases warrant for freebies or how much one needs to purchase to get a freebie, so I guess this is something they randomly roll out? Yaaaay thank you for the rose mask! On the flipside this will go perfectly with my Mamonde rose water gel, facial foam, and toner from previous Althea transactions. 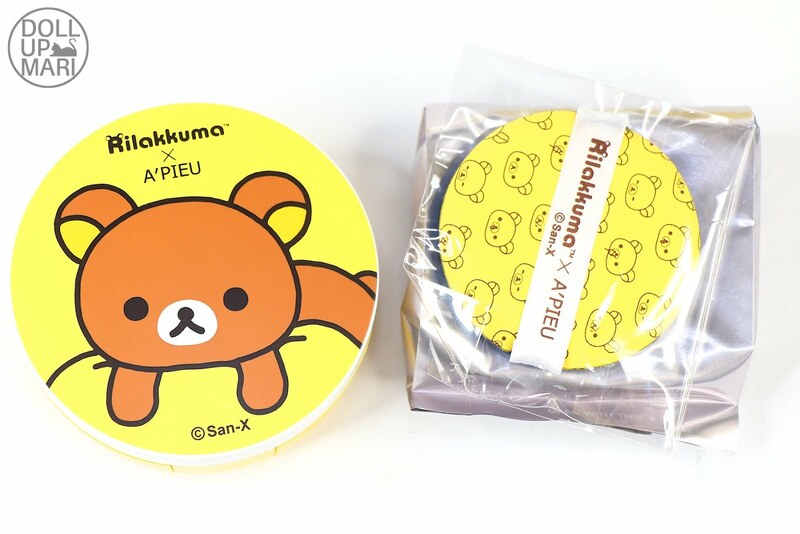 It'll also go well with the Mamonde cream I got from Korea. Right after I lift the mask sheet this whole sea of yellow happiness greets me. I was so excited about this collection that I only made this transaction for this! It's soooo cute to see them all in real life. Sooo I got myself the cleansing foams from this collection. 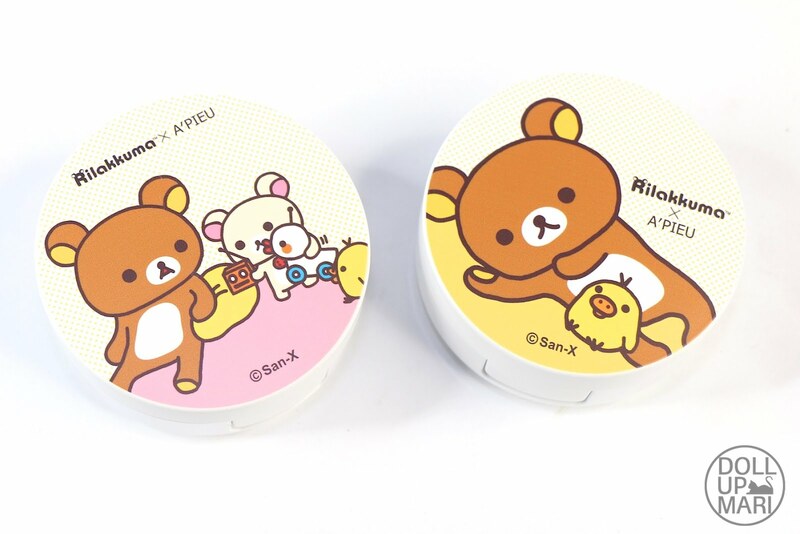 Suuuper cute tubes!!! I also got myself two cushion blushes. I like how each shade has a different design, so while I will still look at the bottom to see the shade, it's aesthetically pleasing to see more than one design. This is how it looks like. I am new to the A'Pieu color system so I got myself basic items. This is CR01. And I also got myself PK01. 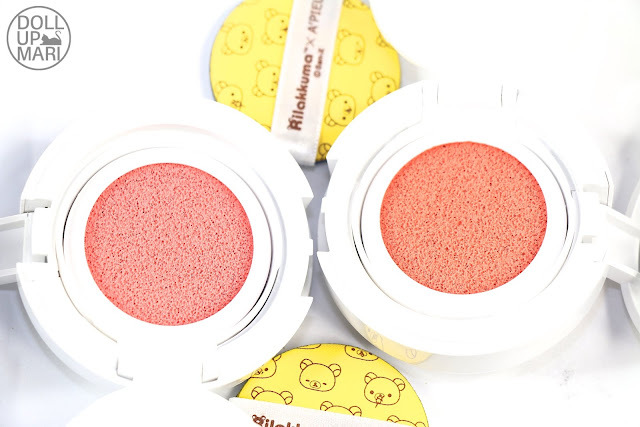 I love myself a good coral pink so I am so excited to use both of them together. I also got myself the BB cushion! 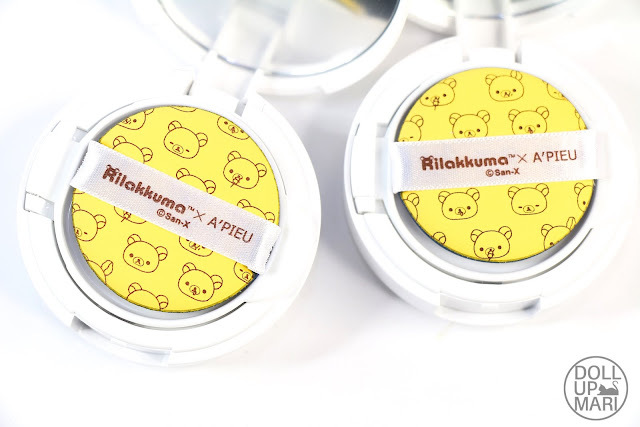 At Php720 it was suchhh a steaaaal because this already comes with the pretty Rilakkuma casing, a cartridge inside with the cute sponge, and a refill cartridge and sponge waiting. Total steal. On a normal day I think that'd just be the primary cushion without a refill and it'd be a normal design. This is how shades 1-4 look like side by side!!! I am sooo happy over the shades that I had to buy them all. They're the perfect mixes of mattes, corals, browns, and bronzes. I have been suuuper into these warmer tones as of late so this will make for many exciting looks. 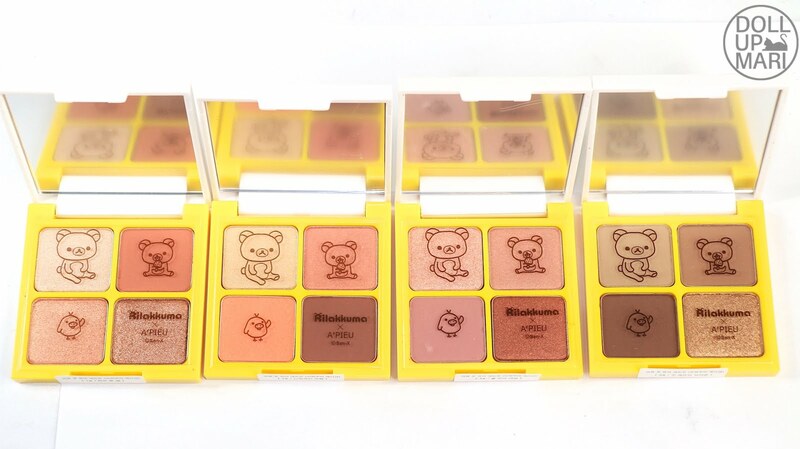 These are alll steals at Php490 per quad given the shade selection! These will all be super useful. Sooo when they came they all had numbers, but I now realize that on the website they're actually names...so if I'm not mistaken.. This is how shades 1 and 2 look up close. 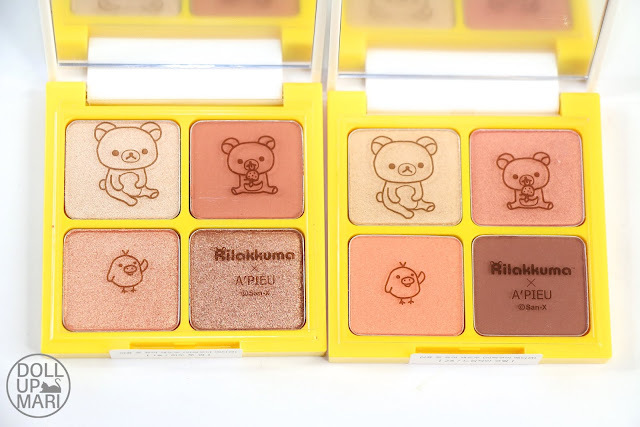 They look similar at first glance, but the eyeshadows have different textures ranging from matte, frosted, satin, and glittery. 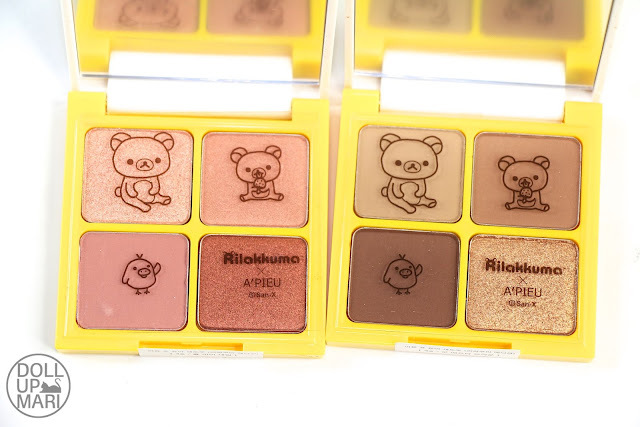 That's why the shades could look similar on the pans but actually contribute different effects in real life. Aaand here are shades 3 and 4. 3 is more standout with its copper tone and 4 with its chocolate brown tone. They really are distinct. I was actually thinking twice about shade 4 because it's already quite a common shade theme, but weell I'm glad I got it in the end because it's sooo pretty in real life. And finally, this is still sealed as I write this buy this is the Water Light Tint in 02-Dreamy Peach. In the swatches on the website this looks like a gloss hahaha.. so I have actually yet to try it and see how it truly behaves. So yaaaay that's it!!! 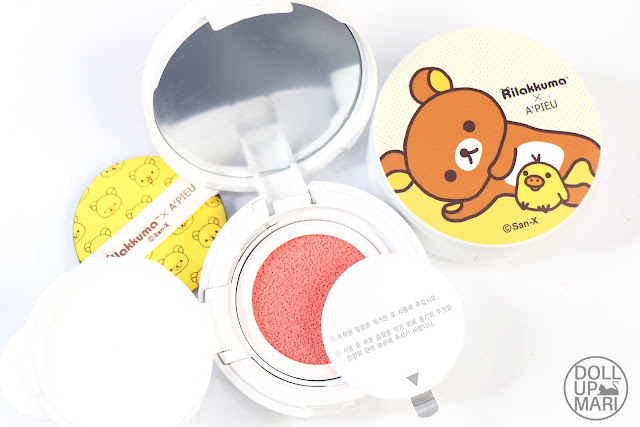 There are always new cutesie collections and collaborations that Korean beauty brands do so keep an eye on them. Also do keep an eye on them when they make their way to Althea because these kinds of items are soooo apt as gifts. People suddenly lose their concept of favored products and brands when cute collaborations are involved, so your worries of giving someone a product or brand they might not like get resolved.